The musicians of the Chicago Symphony Orchestra are known for their distinctive “Chicago Sound,” marked by the precision, clarity, and power that have defined the Orchestra as a world-class institution. As the longest-serving clarinetist in the Orchestra’s history, Soloist John Bruce Yeh has had intimate experience with this high standard of performance. Composer James Stephenson is also familiar with this unique sound, having grown up listening to the CSO during his childhood in suburban Chicago. Between 1892 and 1895, Dvořák was the musical director of the National Conservatory of Music located in New York City, where its founder, Jeannette Meyer Thurber, offered him the job – he was already an established composer. While the Czech-born composer moved to the United States to fill the position, his stay was short-lived because he missed home; however, his goal was to discover American music. While Dvořák was influenced by both Native American and African-American melodies, he never alluded to any particular melody that inspired the New World Symphony. We are a community orchestra which performs five concerts each season. Our players volunteer their time to play with us. 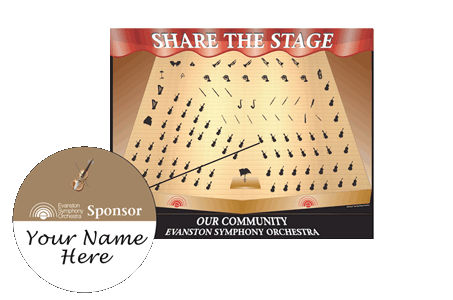 Evanston Symphony Board member Robin Ashton asked ESO Maestro and Music Director Lawrence Eckerling about how he programmed this year’s subscription series line-up. Ashton: Maestro, how do you go about programming a season. Do you start with a theme or what? In 1853, at the age of 20, a young Johannes Brahms nervously presented himself to Robert and Clara Schumann. He was the leading composer of the day, and she was a prominent piano soloist and composer in her own right. This fateful meeting would lead to Brahms’ public introduction, and to a lifelong relationship, both musical and personal, with the couple. While Brahms owed the launch of his career to this great composer, he struggled under the weight of Schumann’s description of him as “a chosen one,” and in the shadow of Beethoven’s revolutionary Symphony No. The ballet is based on the Russian folk tale of the Firebird, which Igor Stravinsky used as inspiration in his score. The Firebird ballet tells the story of Prince Ivan who defeats the evil Kastchei with the help of the Firebird, who offers one of her enchanted feathers to Prince Ivan after he spares her life while hunting in the forest. The feather is later used by Prince Ivan to summon the Firebird when he needs her help as Kastchei’s creatures chase after him. As the monarchy is central to the history and government of England, so it is part of its musical heritage. Crown Imperial, also known as Coronation March, came to life during a turbulent time for the British crown. Composer William Walton originally composed the march for King Edward VII’s coronation, set for May 12, 1937. However, when Edward abdicated the throne in 1936, his brother, King George VI, became king to the tune of Crown Imperial instead. Ralph Vaughan Williams was among the wave of European composers of the time who were interested in utilizing and recording folk music. Vaughan Williams found inspiration in English literature and traditional song, often quoting or imitating British folk tunes in his compositions. He was even a member of the English Folk Song Society, whose members sought to collect traditional music of the British Isles. Nine of these tunes found a place in the composer’s three-movement English Folk Song Suite, which was originally written for military band.